This example shows how to use the tone() command to generate a pitch that follows the values of an analog input. 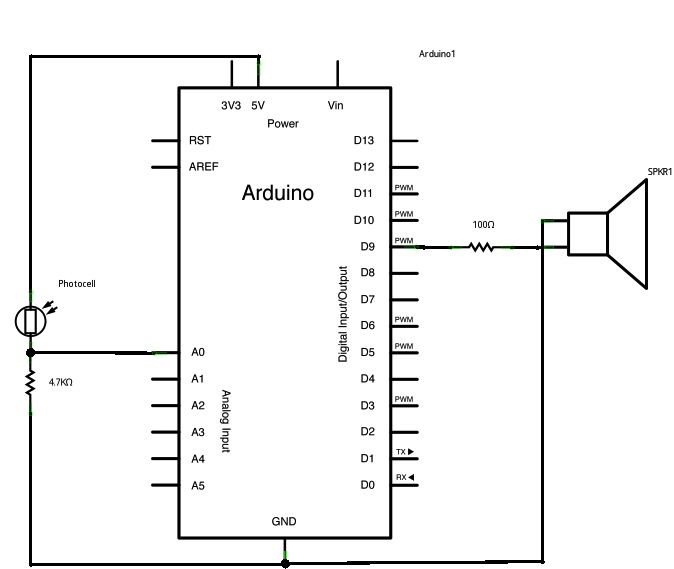 Using a photoresistor your Arduino or Genuino board becomes a simplified light theremin. 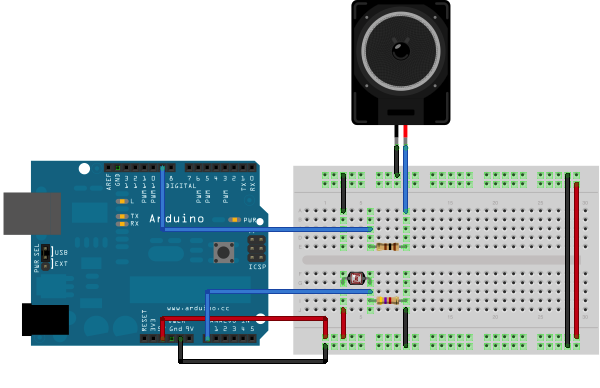 Connect one terminal of your speaker to digital pin 9 through a 100 ohm resistor, and its other terminal to ground. Power your photoresistor with 5V, and connect it to analog 0 with the addition of a 4.7K resistor to ground. The code for this example is very simple. Just take an analog input and map its values to a range of audible pitches. Humans can hear from 20 - 20,000Hz, but 120 - 1,500 usually works pretty well for this sketch. You'll need to get the actual range of your analog input for the mapping. In the circuit shown, the analog input value ranged from about 400 to about 1,000. Change the values in the map() command to match the range for your sensor.